"For those who experienced the Cultural Revolution like me, the biggest change that the reform and opening-up have brought is that you can have a normal life," said Zhang Weiwei, an English interpreter for former Chinese leader and architect of China's reform and opening-up Deng Xiaoping. Zhang, 61, is now the director of the China Institute at Fudan University. When he was 20 in 1977, he was a worker at a Shanghai factory, and the resumption of the university entrance examination, or gaokao in Chinese, has changed his life. He passed the exam and was recruited by the College of Foreign Languages and Literature at Fudan University. Just like Zhang, millions of young Chinese people who were high school graduates, workers, famers, soldiers, officials and educated youth who had been sent to the villages during the Cultural Revolution finally got a chance to use their knowledge to change their destiny in 1977 by getting a college education. Zhang also obtained a master's degree in interpretation, and joined the Ministry of Foreign Affairs to become an interpreter for top Chinese leaders. August 28, 1985. This was the first time Zhang played the role of Deng's English interpreter at a diplomatic occasion, and the visiting foreign leader that day was former Zimbabwe leader Robert Mugabe. 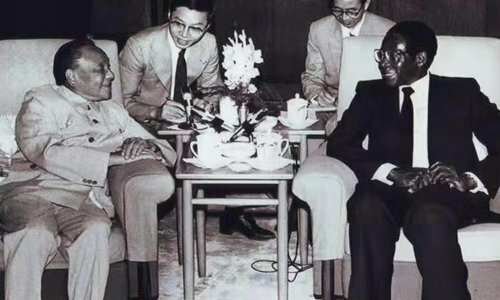 Zhang recalled that during the meeting, Deng shared China's experience on governance with Mugabe, especially China's left-leaning mistakes from the 1960s to the 1970s. Deng's grand vision as a statesman during the meeting left a deep impression on Zhang. He said, "Although Deng was already over 80 years old, he could still envision the plans and issues for the next 20 years, 50 years and even a century. He could design a great strategy for China's future, and this was very impressive." Zhang noted that 1989 was a key year for the reform and opening-up. "During the political turmoil between spring and summer that year, Deng was tough in response to pro-Western forces that tried to overthrow the People's Republic of China." At that time, Zhang was pursuing graduate studies at the University of Geneva. "If not for Deng Xiaoping (tough response in 1989), China would have followed suit of the Soviet Union and collapsed," and China wouldn't have the development and achievements we gained in the past four decades, he said. In 1990, Zhang visited Moscow, and found that this capital of the socialist superpower was full of disappointments. "At the biggest shopping mall, there were no goods, and residents were lining up outside shops or restaurants with little to buy or eat." The collapse of the Soviet Union in December 1991 shocked the world, including China. Many Chinese people were pessimistic about the future of socialism, Zhang recalled. "But three months before the collapse of the Soviet Union, Deng said that history was witnessing a significant shift, and that this was a great opportunity for us." In Chinese, "crisis" consists of two characters - danger and opportunity. This kind of mentality has always guided Chinese people to seek chances from a crisis in China's history, and Deng saw the collapse of the Soviet and Eastern European socialist block as a chance for China to push the reform and opening-up and build up Chinese-style socialism, Zhang noted. In 1992, Deng visited cities in the southern part of China, including Shenzhen, Guangzhou, Zhuhai, Shanghai and Nanjing, and these cities became the leading regions in the reform and opening-up. Deng's tour and keynote remarks consolidated China's determination to implement the reform and opening-up, which would embrace economic globalization and tell the Chinese people that the market economy could not only serve capitalism but also socialism, Zhang noted. In 2012, Zhang ended his overseas life for the academe and returned to Shanghai. He was confident in China's future. In 2013, he paid a visit to a few once backward cities in China's Jiangsu Province, and was deeply impressed by Jiangsu's development. "Jiangsu's population was 10 times Switzerland's or 7 times Greece's, so Jiangsu's success was already meaningful to the outside world, not to mention the rise of the whole China. China's overall success consists of many smaller successes from cities and provinces like Shanghai and Jiangsu," he said. In 2015, he founded China Institute at Fudan University, now a leading think tank in China. As the institute's director, Zhang conducted research on the rise of China and its model of development, its ideas and institutions, and he also paid great attention to analyzing and explaining China's success and experience to people from in and out of China through journals, interviews, lectures and speeches. The US launched a trade war against China in 2018. Some people asked Zhang what would Deng do if he encountered this. 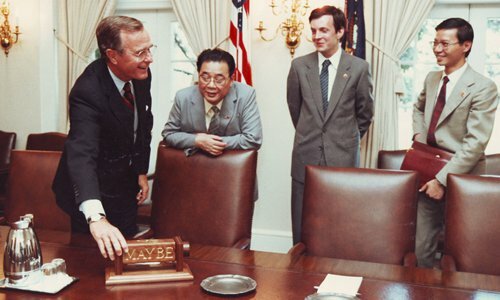 Zhang said "maybe he would see this as an opportunity for China, just like what he did in the early 1990s." The China-US trade friction coincided with the 40th anniversary of China's reform and opening-up, and Chinese leaders have reaffirmed China's determination to further open up while the US embraces protectionism, isolationism and unilateralism. Zhang went to the US to meet with US scholars at Harvard in October, and an American scholar asked him about his views on Donald Trump. "I quoted the words of former US vice president Joe Biden on Trump: Donald, please, grow up."